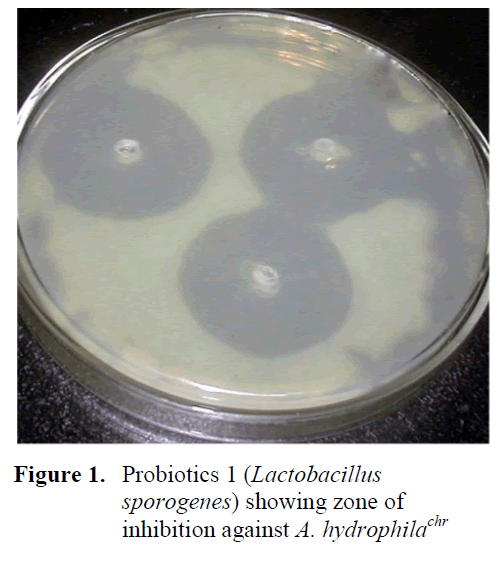 The present investigation was carried out to study the elimination of pathogenic, chloroamphinicol resistant Aeromonas hydrophila (A. hydrophilaChr) by the use of single pro-biotics; Probiotic 1 (Lactobacillus sporogenes), Probiotic 2 (Saccharomyces boulardii) or mixture of probiotics; Probiotic 3 (Nitromonas spp., Rhodococcus spp., Bacilus megaterium, Lecheni formis, Desulphovibrio sulphuricum, Psuedomonas spp., Chromatium spp., Chloro-bium spp., Thiobacillus spp., Thioxidants spp., Thiobacilus ferroxidant, Methylomonas methyanica, Glucon acetobactor, Azospirillum spp., Trichoderma spp., Shizophyllum commune and Sclertium gluconicum); in vitro as well as in vivo. For this purpose probiotics 1, 2 and 3 were tested against the pathogenic Aeromonas hydrophilachr. In vitro experiment revealed that the zones of inhibition of probiotic 1 were highest than probiotic 3 followed by probiotic 2 with values of 19.67 ± 0.67, 19.33 ± 0.33 and 17.00 ±0.58 mm, respectively. In vivo experi-ment also showed that the elimination of pathogenic A. hydrophilachr from 1.54 x 1011 CFU/mL to 1.90 x 101, 2.30 x 101 and 5.33 x 101 CFU/mL lasted four weeks by probiotic 1, probiotic 3 and probiotic 2, respecticvely. In conclusion, the viable counts of pathogenic bacterium were the highest in the fish inoculated only with the pathogenic bacteria 6.07x1012 cells/mL in four weeks. Probiotic cultures used had significantly reduced the viable count of A. hydrophila in fish. The numbers of viable counts was the lowest in catfishes treated with probiotic 1 followed by probiotic 3 and probiotic 2 over a period of four weeks. Aeromonads are the major pathogens in the fisheries sector. A. hydrophila is an opportunistic pathogen of a wide variety of hosts. This bacterium inflicts serious damage in pond and aquarium cultures. The pathogenesis and histopathology of the red-sore disease was extensively studied in the common carp (C. carpio) and the Channel catfish (Ictalurus punctatus) (Harikrishnan et al., 2009). Probiotics microorganisms may release chemical substances that have a bactericidal or bacteriostatic effect on other microbial populations; they do so by altering interpopulation relationships like competition for chemicals or available energy rich compounds, producing inhibitory substances in the intestine of the host, on its body surface, or in culture medium where organism live and create a barrier against the proliferation of opportunistic pathogens [Watson et al, 2008]. The major taxonomic groups contributing to the healthy intestinal flora of fish species include Vibrio [Austin et al, 1995], Lactobacillus [Kacem and Karam, 2006], Acinetobacter, and Achromobacter, followed by Bacillus and representatives from the family Enterobacteriaceae [Ringo and Strom, 1994]. The probiotic bacteria generally present in the soil, pond bottom and water and grow well at temperature range 25-37 0C. In aquaculture, non-pathogenic strains of identified bacteria have been successfully used as probiotics to control the diseases in fish [Gomez-Gil et al, 2002]. These probiotic bacteria suppress proliferation of pathogenic and opportunistic bacteria in the mucus in intestine as well as ambient environment of the fishes simultaneously [Balcazar et al, 2006]. Consequently the probionts reduce the incidence of diseases. Earlier studies, Dahiya et al , observed pathogenicity of A. hydrophila, and disease symptoms caused in Indian magur (Clarius batrachus L.). So, keeping above facts in mind; present investigation was proposed to investigate the elimination of pathogenic bacterium Aeromonas hydrophila by the use of three probiotics. Probiotics 1 and 2 or Probiotic 3 cultures were used to observe in vitro and in vivo antagonism effects against pathogenic bacterium, A. hydrophila. Probiotics 1 contained only single bacterium named lactic acid bacteria (Lactobacillus sporogenes); Probiotics 2 contained single fungus (yeast) Saccharomyces boulardii while probiotics 3 contained a mixture of many bacteria including, Nitromonas spp., Rhodococcus spp., Bacilus megaterium, Lecheni formis, Desulphovibrio sulphuricum, Psuedomonas spp., Chromatium spp., Chlorobium spp., Thiobacillus spp., Thioxidants spp., Thiobacilus ferroxidant, Methylomonas methyanica, Glucon acetobactor, Azospirillum spp., Trichoderma spp., Shizophyllum commune and Sclertium gluconicum. In vitro test of probiotics against the pathogenic bacteria. i) Pathogenic bacteria (A. hydrophila) of 106 CFU (colony forming units) was poured into melted nutrient agar (beef extract 3g, peptone 5g, Sodium chloride 5g, agar 15g for one liter volume at pH 7.0±0.2), at 60-62 0C; and mixed well by shaking then poured into petri plates, and allowed to solidify in laminar flow. ii) Three well were bored in solidified NA containing pathogenic bacterium A. hydrophila by the well borer and every time the borer pipe was sterilized on the flame. iii) Then 5-10 μl melted water agar (15 g Agar + 1 litre distilled water) was added at the bottom of the each well with micropipette; to prevent the seepage of the probiotic bacterial suspension to the bottom of Petri plates. iv) Then the probiotics 5x 1011 (50 μl) were added to each well and plates were incubated in B.O.D. at 35-37 0C for 18-24 h. The Zone of Inhibition was measured with simple scale and recorded. Antibiotic chloroamphinicol resistant A. hydrophila (A. hydrophilachr) was taken intraperitoneally as pathogenic organism for inoculation from catfishes (Clarius batrachus L.). The treatments of experiment are given in Table 1. Each treatment has three replicates and one Indian magur from each replicate was sacrificed at weekly interval, and viable counts of A. hydrophilachr were worked out using serial dilution method. The obtained results were analyzed statistically using completely randomized design (CRD) to evaluate differences among different treatments means at 0.05 significant levels [Snedecor et al, 1989]. 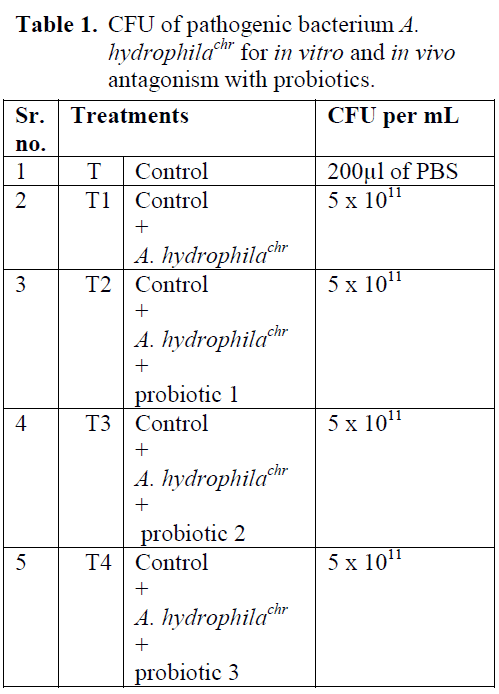 Table 1: CFU of pathogenic bacterium A. hydrophilachr for in vitro and in vivo antagonism with probiotics. Inhibition zone of probiotic against A. hydrophilachr was found to be different in each treatment. Probiotic 1 showed bigger inhibition zone as compared to probiotic 2 and probiotic 3 against each bacterium. From these results, it is concluded that probiotic 1 was better than probiotic 3 and probiotic 3 was better than the probiotic 2, in gushing out the pathogenic bacteria- A. hydrophilachr from diseased catfishes (Table 2; Figure 1, 2, 3). The results of viable counts of pathogenic bacterium A. hydrophilachr under different treat-ments over a period of four weeks are presented in Table 3. The number of viable counts of cat-fishes injected with A. hydrophila (Control-T1) increased from initial value of 1.54 x 1011 to 6.07 x1012 cells/mL in four week. The viable counts of A. hydrophilachr became so high in fifth week that the catfishes could not tolerate and subse-quently showed mortality. But the catfishes inoc-ulated with A. hydrophila along with the three probiotics 1, 2, and 3, showed progressive de-cline in the viable counts of A. hydrophila from initial value of 1.54 x 1011to 1.90 x101 in four week, whilst the bacterial load in T3 and T4 dropped from initial value of 1.54 x 1011to 5.33x101 and 2.30x101 cells/mL in four week, respectively. A. hydrophila was successfully eliminated by the all of three probiotics 1, 2 and 3. Comparatively, probiotics 1 showed best re-sults among these three probiotics (Table 3). Table 3: CFU of A. hydrophilachr under in vivo induced pathogenicity over a period of four weeks. The mode of action of the probiotics is rarely investigated, but possibilities include competitive exclusion principle i.e. the probiotics actively in-hibit the colonization of potential pathogens in the digestive tract by antibiosis or by competition for nutrients and space, alteration of microbial metabolism, and by the stimulation of host (hu-man and animals) immunity [Irianto and Austin, 2002 and Dahiya et al, 2011]. 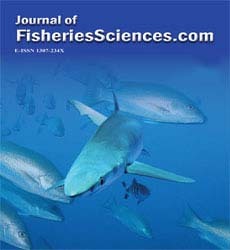 There are several modes of probiotic action in the aquatic environ-ment, these may include improved feed conver-sion efficiency and feed utilization, higher adhe-sion capacity to the intestinal mucosa and reduction of adherence of pathogenic bacteria, produc-tion of extra-cellular antibiotics or iron chelating agents (siderophores) which prevent the growth of almost all pathogenic bacteria [Verschuere et al, 2000] and improvement of water quality (bio-remediation) especially in the pond and reducing the problem of red tide planktons [Watson et al, 2008]. Probiotic strains of V. alginolyticus found very effective in reducing disease caused by the A. salmonicida, V. anguillarum and V. ordalli in aquatic animals [Austin et al , 1995]. A culture of V. alginolyticus with Chaetoceros meulleri is also used as a potent probiotics [Gomez-Gil, 2002]. A similar study was conducted in shrimp farming, in which a marine strain of Pseudomonas was found to inhibit pathogenic Vibrio bacteria [Chythanya et al, 2002]. In the present investigation the viable counts of pathogenic bacterium A. hydrophila were the highest in the catfishes without probiotic inoculations. However, these counts decreased in the presence of probiotic in catfishes. The numbers of viable counts were the lowest in probiotic 1 compared to probiotic 3 and probiotic 2 over a period of four week. Similar results were observed by Nimrat and Vuthiphandchai , they found the inhibition ability of probiotic, Lactococcus lactis RQ516, against A. hydrophila, in vitro with 14.77 ± 1.17 mm zones of inhibition and; immunostimulator and growth promoter, in vivo in tilapia, Oreochromis niloticus. Although, their study was on different fish with different probiotics and pathogenic bacterium, but pattern of inhibition in both in vitro as well as in vivo was found same. The study results were in agreement with results of Zhou et al  who observed inhibition effect of twelve commercial probiotic products against pathogenic bacterium Vibrio harveyi in marine shrimp. In the present investigation the similar results were obtained i.e. all three probiotics inhibit the pathogenic A. hydrophilachr; both in vitro and in vivo experiments. In conclusion, the viable counts of pathogenic bacterium were the highest in the fish inoculated with only pathogenic bacteria. However, these counts decreased in the presence of probiotic in fish. Probiotic 1 was found to be more inhibition effect on the growth of A. hydrophila, followed by Probiotic 3. The numbers of viable counts decreased more in probiotic 1 as compare to probiotic 3 followed by probiotic 2 over a period of four weeks. Dahiya, T., Ravi, K., Sihag, R.C., (2009). Pathogenicity of bacterial isolates from catfish C. batrachus (The Indian Magur), Journal of The Biosphere, 1(1): 42-46. Dahiya, T., Verma, R.K., Saini, V.P., Pawan Kumar Yadav P.K., Kumari, M. (2011). Probiotics: A potential medicine for Aqua-culture, Veterinary & Human health, Agro-tech Publishing Academy Udaipur, Raja-sthan. Gram, L., Melchiorsen, J., Spanggaard, B., Huber, I., Nielsen, T.F., (1999). Inhibition of Vibrio anguillarum by Pseudomonas fluorescens AH2, a possible probiotic treatment of fish, Applied Environmental Microbiology, 65: 969-973. Harikrishnan, R., Balasundaram, C., Moon, S.H., Kim, M.C., Heo, S., (2009). Use of herbal concoction in therapy of goldgish (Carassiusauratus ) infected with Aeromonashydrophila , Bulletin of Veternary Institute Pulawy, 53: 27-36. Kacem, M., Karam, N. (2006). In vitro preselec-tion criteria for probiotics Lactobacillus plantarum strains of fermented olives origin, International Journal of Probiotics and Prebiotics, 1(1): 27-32. Nimrat, S., Vuthiphandchai, V. (2011). In vitro evaluation of commercial probiotic products used for marine shrimp cultivation in Thailand, African Journal of Biotechnology, 10(22): 4643-4650.
ingo, E., Strom. E., (1994). Microflora of Arctic charr, Salvelinussalpinus (L.): gastrointestinal microflora of free-living fish and effect of diet and salinity on intestinal microflora, Aquaculture & Fisheries Management , 25: 623-629. Snedecor, G., Cochran, W., Cox, D., (1989). Statistical Methods (8th edition), The Iowa State University Press. Verschuere, L., Rombaut, G., Sorgeloos, P., Verstraete, W., (2000). 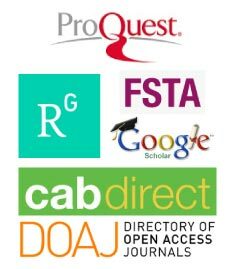 Probiotic bacteria as biological control agents in aquaculture, Microbiology & Molecular Biological Research, 64: 655-671. Zhou, X., Wang, Y., Yao, J., Li, W. (2010). Inhibition ability of probiotic, Lactococcuslactis , against A. hydrophila and study of its immunostimulatory effect in tilapia (Oreochromisniloticus ), International Journal of Engineering, Science and Technology, 7(2): 73-80.